The Miradouro Portela, or Portela Lookout Point, situated between Porto da Cruz and Machico, allows visitors to observe one of the most beautiful landscapes in Madeira. The coastal lookout point boasts a panorama of mountains, villages and the sea as well. Time spent here is worthwhile, especially with a lunch at Restaurante Miradouro da Portela right on the road. Many choose to take the bus or to drive to Portela from Funchal, while others take the hiking trail from Ribeiro Frio in Santana. In fact, the Ribeiro-Frio-to-Portela walk is one of the most popular levada routes, and in fact can be quite crowded in the high season as its medium level of difficulty is attractive to a wider variety of hikers. Portela is reached by SAM bus no. 53 or 78 from Funchal; for those wishing to end at Portela via the levada walk, take the bus no. 56 to Ribiero Frio. Experience the culture of Madeira during this full-day tour leaving from Funchal. On this tour see artisans at work in Camacha and the renowned cottages atop Santana mountain village. 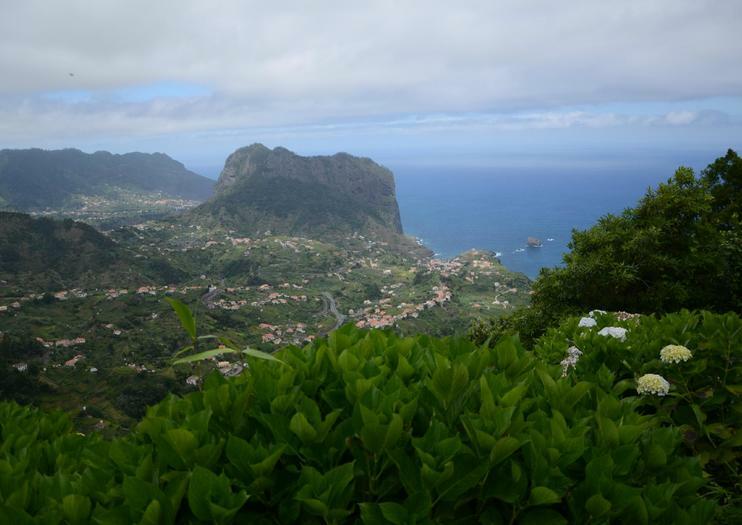 Also while visiting east Madeira, capture stunning views in Pico do Arieiro, Ribeiro Frio, and Portela. Explore the delights of the Levada dos Balcoes walk plus off-road Jeep on this full-day tour departing from Funchal. Your journey begins at the stunning Pico do Arieiro, where you can admire Portugal’s dynamic landscape and, if you’re lucky, local wildlife. Then venture to the center of Santo da Serra, including the levada walk “Balcões” at Ribeiro Frio. Admire the mystical Laurissilva forest before returning to hotel or similar accommodation. Journey to the lesser-seen side of Portugal on this off the beaten track 7-hour Jeep tour, from Funchal. See Santana, a renowned UNESCO biosphere reserve, where you can explore traditional houses. If you choose, you can select an option to go trout fishing for your lunch. Enjoy a convenient pickup at your hotel. Book and personalize this private tour done for you and your group by UMM in our cool army open top jeep, in a calm relaxed laid back trip driving through the old roads and off roads, This is the perfect ride for people visiting us on cruises, you can choose your route or personalize it for those wanting to explore and discover a beautiful agricultural hidden Madeira, going from sea level to 1000 meters will allow us to have a view over the Nun's Valley from a side were not many see, and go local for a great mountain freshly made poncha. Discover Madeira Island in a whole different way!We are excited to offer you unlimited fun, riding the new Honda CRF450RX. Discover the trails and venture off-road on the hills of Madeira Island, guided by a local experienced rider.If you're a seasoned rider, or just a beginner, we will customize your tour according to your taste and skill. Come ride with us!